I think it’s fair to say, no matter which side of the political spectrum you fall on, that Donald Trump’s visit to the UK has been something of a disaster for everybody involved. Trump has criticised every last facet of English life, blamed the Mayor of London Sadiq Khan for ‘rising terror’ and said Brexit is a shambles (he’s got a point) while writing off the UK as a trading partner in the immediate future… cheers Don, just what a nation so recently united by our national football team needed to hear. In the 18 months or so since Trump became President, it hasn’t surprised anyone that he’s been doing things his own way. To many, it’s been appalling. To others, it’s been a dose of what they think the world needed. He’s not a career politician, he’s been a billionaire since the moment he was born and doesn’t play by the rules a functioning society is used to seeing their leaders play by. One thing both supporters and denigrators of Trump can agree on is that he has a huge ego. One of the biggest egos, he might tell you. You’d imagine his ego wouldn’t stretch so far as to disrespect the Queen of England though, but that’s exactly what happened upon his meeting with probably the most respected woman on the planet. Just as an aside, wouldn’t you love to be a fly on the wall the first time they met. What on Earth do they have to talk about?! Anyway, the US President was quickly condemned on social media by the thousands watching his meeting with Queen Liz during a guard of honour of the Coldstream Guards. I can't even watch this… No bow or curtsey and now #Trump walks in front of the Queen #TrumpUKVisit surely he knows the protocol but chooses to ignore it and that's just bloody rude ? 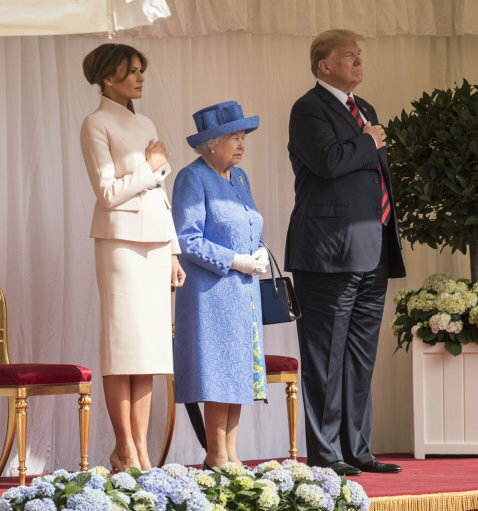 Within just minutes, Trump was walking in front of the Queen – a huge no no – leaving her to decide which side of him to go as she caught up with him. To make matters worse, earlier in the day, when Trump and his wife Melania first greeted the Queen, neither of them did what is considered good manners when greeting a monarch. The proper protocol is for a woman to curtsy and a man to bow. The Trumps however… they shook hands. Now, to be fair, it’s not in any rule book that you HAVE to curtsy or bow, but it just shows a little humility and respect for a woman who’s given her life to serving her country. The Trump greeting was in stark contrast to Theresa May meeting the Queen last month, when her wildly deep curtsy caught the eye of some meme lords who decided to have a field day taking the p*ss. A royal family spokesperson told The Independent that while it is a general courtesy to ‘curtsy or bow’ before members of the royal family, particularly the Queen, it was technically still down to personal choice. The official monarch guidelines say there are actually no obligatory codes of behaviour but that it’s seen as good manners to conform to tradition. Let’s hope the rest of Trump’s trip to the UK goes smoothly. Something tells me it won’t.